Oh, but seeing that lovely old predator gave me a warm fuzzy feeling inside! And I love your 'digital' painting score! Since the Minis are all metal or plastic, it is just our care of them which determines if they survive. I recently pulled out my old "Space Marine" epic game pieces which had been stored in my childhood closet for 15+ years and they look just like I left them still unpainted. 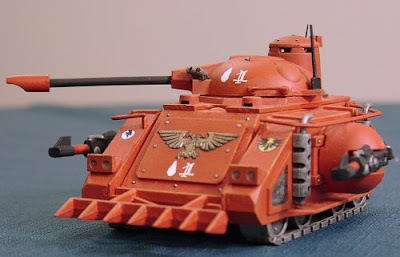 I did not play 40K back then so I do not have any ancient marine stuff but I do have like 5 classic metal blood bowl teams that look way better than the newer ones. I wish Forge World would produce more models with the older look. A couple of random pieces could really make an army look unique.